The cool morning of July 22, 1918 was slowly awaking. The hum of engines being warmed up could be heard at the advanced airfield, and mechanics were working amidst little Sopwith Camel biplane fighters of 203 Sqn RAF. The most numerous crew worked at two airplanes that stood aside and had Cooper bombs slung underneath. These two were to be the first to ascend in a moment. Major Raymond Collishaw and Captain “Titch” Rochford leant over the map. The squadron leader had decided to attack the German airfield where a reconnaissance machine had discovered aircraft the preceding evening. It did not take them long to choose the direction of the approach, as they were merely 40 km away from the target. A moment later both pilots took seats in the cockpits of their Camels and, aided by the ground crew, started the rotary engines. Curls of bluish fumes puffed out, the engines roaring at the highest revs for a while to change to a monotonous rattle after that. A quick good-bye and the two Camels rolled along the airfield surface. After several seconds they were in the air, making a right turn and heading east. For a while Ray Collishaw watched the still turning wheels of the landing gear. He always did that after takeoff. The blow caused by the propeller thrust him with great force. The wind blew all over the Canadian’s head, which was protected with a pilot’s cap, and it moved the ends of the scarf wrapped around his neck and face. The eyes were protected by goggles. Although it was a summer morning, the air getting into the cockpit was cold and penetrative. From the right side he was approached by “Titch” Rochford pointing at the machine guns with the hand. Ray nodded and they pressed the triggers almost on the same instant. The test bursts confirmed that both the guns and ammunition belts were in order. They were ready for combat. Visibility was perfect. Ragged white clouds floated slowly in the blue sky at various heights. They crossed the frontline at 3,000 m. What they saw was a moon landscape with bomb craters, ruined villages, scorched trees, and trenches extending for a few kilometers into enemy territory. In places, columns of smoke rose into the sky. The landscape was evidently different beyond the frontline area. The Camels were now flying above the saturated green of forests, fields and meadows crossed by rivers and country roads. The pilots were scrutinizing the space around and verifying their direction. At last they saw a town with a railroad station. The tracks here ran in three directions. A steel caterpillar was slowly advancing along one of the silver threads, its head hidden in clouds of white vapor. The Camels continued along the track for a few minutes until they reached a road that crossed it. The aircraft bunted and dived towards the ground. The country road now turned south and disappeared in a thick birch forest. The two Camels roared over the forest clearing. Although there was a sea of green below, Collishaw and “Titch” knew that the road would take them straight to their destination. Therefore they were careful not to lose the sight of it for the foliage. Finally they noticed a church tower in the distance – it was Dorignies, their objective. The forest ended suddenly. The Camels roared low above the ground straight at white houses with red roofs. A turn left, and in front of their engines they saw a wide field with mechanics walking around undisturbed. Across the airfield was a camouflaged single hangar, and a barrack and tents were situated aside. Without a moment of hesitation, the Camels, engines roaring, directed straight at the hangar. It was a complete surprise. “Titch” Rochford dropped his bombs, hitting the building. Flames and clouds of smoke rose up. The 11 kg Cooper bombs destroyed the hangar’s roof, flames having already begun to devour it. In the meantime, Ray Collishaw had dropped his bombs on the tents and the wooden barrack. Clouds of dust accompanied by red flashes of explosions rose into the air. Although the engines roared, the blasts could still be heard. The German soldiers on the ground panicked – they began to run about like ants when someone tramples on the anthill. Chaos took control of the entire airfield. The Camels passed low above the ground and made a tight turn over the wall of the forest. Now they were roaring above the margin of the forest at a tree top height and could watch the outcome of their attack – the hangar was in bright flames and clouds of smoke were rising above the destroyed barrack. Mechanics were running around the entire airfield in fear, but the machine gun positions were empty, as no one was able to think about defense now. It soon became apparent why – in great rush, German mechanics rolled one, then a second, and finally a third biplane out of the burning hangar. The Camel pilots watched in surprise, but there was no time for analyses, as a first machine gun already rattled from a position protected by sandbags. Collishaw pointed the German defense to “Titch” in order that he distract it, and he himself directed towards the standing aircraft. He dashed at some 10 m above the ground toward the hangar. From the corner of his eye he managed to observe small fountains of sand emerging around the machine gun position – it was Rochford in action. He set his sights on the first Albatros and activated both his machine guns with short bursts in order to prevent a jamming. He was very glad to see the Vickers’ rounds hit the wings and fuselage of the German machine. He passed just above it and u-turned for another attack. Now his bullets also perforated the two biplanes next to the first one. On his third pass, one of them suddenly burst out into a huge ball of fire, Collishaw turning at the last instant to avoid flying into the cloud of smoke and fire. Burning petrol spilled onto the ground. At the same time single shots could be heard coming from the ground – it was German soldiers standing near the hangar and shooting at him from their guns, but they quickly had to run for cover, as they were fired upon by “Titch” Rochford. This allowed Collishaw to easily make two more attacks on the standing aircraft, even though a few bullet holes had appeared in his Camel’s wings. All three Albatroses were burning with bright flames against the smoke of the destroyed hangar. At some point Collishaw noticed an airplane approaching from the east. He left the airfield alone and began to ascend. A German biplane was just passing at 100 m, probably going to land on the airfield. The crew saw the coming danger and rapidly maneuvered close to the ground. It was too late, though. The excellent agility of the Camel did not let them escape the predicament unharmed. After a few violent turns Collishaw found himself forty meters behind the Albatros’ tail. Two short bursts hit the engine of the German machine. Fire appeared at once, and a moment later the plane crashed into the ground, the debris scattered on the airfield’s takeoff area. He climbed and wagged the Camel’s wings as a sign to break off the action and return to base. “Titch” Rochford joined him and the two of them headed west. Collishaw saw “Titch” taking off his scarf and shouting something to him with a happy face. The sound of the engine and the blowing wind drowned the other’s voice, but Collishaw guessed what it was about. He only nodded his head and ordered Rochford to watch the sky around them – it would be a great shame to be jumped after such a successful action. Upon landing, “Titch” shook his hand for a long while, congratulating him on his success. But Collishaw knew that he owed everything to the very fact that he had not had to take care of ground fire. Anyway, he decided to check what damage they had caused at Dorignies. He immediately had his aircraft refueled and rearmed, and he took off again. Rochford would have flown, too, but his machine appeared to have taken too much damage, whereas all the other planes were on patrol at the moment. Ray Collishaw flew alone. This time Dorignies proved to have aerial protection – a lone Albatros fighter was patrolling the sky. Collishaw knew very well that his plane was far superior to the German machine. He at once turned his Camel in that direction and attacked from below. The Albatros pilot noticed him against the ground and a circling combat commenced. The aircraft circled like crazy in tight turns. The air filled with the roar of engines working at the top revs. Ray felt the Camel vibrated for overloads, but he was gradually getting advantage. Left and right turns followed one another, the Camel being apparently more agile. Finally Collishaw got his gunsight set on the cross-shaped Albatros. Short bursts came from the nose of the British fighter, piercing the enemy’s skin. The Albatros shook, flew on straight for a while, and then it was struck by a violent explosion. A hit in the tanks! The Albatros caught fire and glided down to the ground, smoke trailing behind. Seconds later it crashed amid the trees of the forest. The aerial threat now gone, the Canadian directed over the airfield. The pungent stench of burnt matter could be smelled in the air. While still approaching Dorignies, he noticed the still rising column of smoke over the destroyed hangar. The burnt remnants of the three Albatroses lay in front of him, still giving off smoke. The wooden barrack was still smoldering, too, but the soldiers around it were probably busy trying to extinguish the fire. This time the Germans were at their posts and when the Camel only appeared nearby, they sent long machine gun bursts in his direction. Collishaw made a turn and headed for the frontline. He proudly reported to the headquarters that Dorignies airfield had sustained severe damage, he himself having destroyed three aircraft on the ground and two in midair. The history of WWI aviation development showed that the era of designers and visionaries, who drew aircraft designs later realized by the skillful hands of versatile specialists, was a matter of the past. So was is the legend of aviation pioneers. All personnel of then newly created air services belonged to that era. Sopwith Camel has secured its place in the legend of those aerial struggles. A famous fighter of combat pilots. Although the S.E.5, sometimes considered the best Allied WWI fighter, was more modern, the Camel overshadowed it anyway. This heroic association is doubtless a consequence of the timing of its frontline arrival. In mid-1917 the British could in no way successfully deal with the Axis air forces. Hopelessly obsolete machines such as the D.H.2 or F.E.8 were destroyed in great numbers along with their pilots, while imported French aircraft could not help much. The worst came in April 1917. 40% of British aircrews lost against twice lesser German losses. It was also tragic in that it happened with German aircraft operating in half the strength of the British ones. The Camel came as a relief. Beginning to restore balance on its arrival at the front in June 1917. Changes of design trends will unable it to match German aircraft again a year later. But once attained legendary status remained. Reequipement of the newly born (1.04.1918) RAF with modern planes will again be too slow. Camels tried as hard as they could but the situation was becoming dramatic. Efecting in the irony reading the RAF’s name as “Royal April Fools”. This expression having been often used by pilots who despite that… kept fighting. Sopwith’s “Faire sans dire” policy (do without talking) directed the whole life of Thomas Sopwith, a recognized British aviation pioneer. He initially dealt with aeronautics, eventually becoming attracted by aircraft. As he was a good pilot himself, he opened a flying school, and in 1911 left for the US, where he took part in aircraft shows. The experience he gained made him determined to build his own machines. Soon he constructed the first British flying boat. Prior to WW1 he mainly manufactured to supply the needs of naval aviation. In his work he was aided by equally respected designers: engineer Herbert Smith, chief of workshops Fred Sigrist and test pilot Harry Hawker. In 1913 this cooperation resulted in an aircraft purpose-built for aviation shows – the Sopwith Tabloid – and the success of its floatplane version in the 1914Schneider Cup competition strenghtend the company’s position. Outbrake of world war brought with it the arming of the Tabloid and commencement of mass production. Mainly for the RNAS (Royal Naval Air Service). It also concerned a few other military types, initiating the Sopwith Strutter, Sopwith Pup and Sopwith Triplane being the famous ones. The simple reason for the Sopwith F.1 to exist was the equipment crisis. Signs of it appeared as early as 1916, when the aircraft used by the RFC and RNAS, either British or French made, proved obsolete compared to the Fokker DI used then by the Germans. It was even more true in case of Albatros DI and DII fighters with two synchronized guns. Cecil Lewis wrote that for Allied pilots “to face a Fokker was equal to the death sentence”. Pilots’ morale needed to be raised. It was probably at that time that Sopwith Aviation Co. Ltd. in Kingston on Thames near London, was informally encouraged to consider upgrading Sopwith Pup with a more powerful engine and arming it with two machine guns. The aircraft was to be faster and more maneuverable. The two guns, so far unprecedented in British military aviation, were to restore its combat advantage. Both the RFC (Royal Flying Corps) and RNAS were interested. The company directors and designers: Thomas Octave Sopwith, Fred Sigrist and Harry Hawker, soon saw that they would not benefit much from redesigning the Pup, so an entirely new aircraft needed to be built. The designers were to some degree influenced by the Triplane construction, especially in terms of its excellent maneuverability due to the low wing loading resulting from the concentration of the most of aircraft’s weight (i.e. engine, weapons, pilot and fuel tanks) near the gravity center. Applying this principle to a biplane wasn’t easy, but the resulting design came close to specification despite some predictable minor flaws. Herbert Smith and R. J. Ashfield, who then worked for the company, were responsible for taking care of the details of the design. Today’s designers may be surprised, but at that time Sopwith as well its main competitor Fokker did not have any drawing boards for its designers. Prototype details were simply chalked on the floor. Manufacturing was done according to these drawings without any structural tests. Instead, the great experience of the whole team successfully worked instead of such tests. Real detailed blueprints for mass production were prepared later. But these were also done the simplest way, without even the aid of drawing boards. All inventions pass the stage when only their good side is to be seen. Later, time shows their flaws and imperfections. This was the case with aircraft rotary engines. Today rather no one writes poems about aircraft engines, attaching to them romantic features. But it was a fact that the rotary was at that time the hope of aviation and inspiration for engineers. (Laurent and Louis) as a development of 1900’s Oberursel Motoren Gesellschaft licensed small stationary engine. The result was a bigger unit of 5 air-cooled cylinders. Its 34 hp were initially to propel a fast motor boat via transmission gear. It was named “Gnome” (dwarf) and was also stationary. Cooling deficiencies were soon discovered and in trying to find better cooling conditions a 7-cylinder rotary was developed, in which the bank of cylinders spinned with the propeller, while the shaft remained stationary. For those times the construction was perfect. It had a small weight of 75 kg, was rated at 50 hp (thus the name Gnome Fifty) at 1,200 rpm, and it easily fitted to an airplane. It should be noted that most internal combustion engines were car-type – water-cooled, big and heavy. These features and their constant tendency to get overheated made them irrelevant for aircraft. There were air-cooled static aircraft engines at the time (e.g. By the famous V. Anzani company) but their cooling was insufficient for little knowledge of combustion physics and low-octane value of fuel at the time; they were not very reliable. Therefore various types of rotary engines soon dominated in aircraft, as the rotation of the bank of cylinders (20-25 rpm) seemed to promise no “undercooling”. Soon aircraft began to be fitted with series-produced engines of the type. In 1909 the Gnome of 34 hp was the best known, weighing 55.5 kg, which gave an excellent index of 1.63 kg/hp. The power soon increased, first to 50 hp, then 60, and finally 80 – the 80-hp unit was the one to become “mobilized”. It turned out, however that a four-stroke rotary had a bad side coming along with the good one. The fact of its being driven by a hollow stationary camshaft which was at the same time the fixing point was a hard issue. The big rotating mass and problems with balancing it effected great centrifugal forces partly out of symmetry. These forces spoilt the reliability of the timing gear and fuel-feeding. In extreme cases cylinders would break off, which usually resulted in a crash. Therefore power could not be higher than approx. 200 hp, for that would have meant a greater cylinder capacity, which would have entailed a greater weight (and centrifugal forces). The heavy bank of cylinders being settled on the camshaft was often the cause of engines breaking off due to shaft cracks, especially at those times of inconsistent quality wartime production. This was addressed by using light alloys for cylinder construction, but even then the loss of weight was not significant. Also, those engines usually worked at full throttle only, as they were controlled by ignition, which was hard to handle and unreliable, and not by dosing fuel. Time between repairs was ca. 30 hrs of running despite an almost perfect lubrication by modified castor oil. This oil should be mentioned in greater detail. Obtained from oil tree seeds, it provides very good lubrication in a range of working temperatures in petrol engines. Its disadvantage was that in time it turned into fatty acids, which “stuck” engine installations. This degradation depended on UV rays, contained e.g. in the sun’s rays. Castor oil was a strategic product in WW1. That was not an advantage to the Axis, as the tree usually grew in Africa or the Far East, and economical ties with those countries were limited, even more so for the war. This effected attempts to used mineral oils as substitutes, especially in rotary engines, which had an “open-circulation” lubricating system. Construction-wise, reliability of the rotary was a difficult task to accomplish. The search for an optimized solution resulted in various modifications usually related with timing gear. Originally it was a “monosoupape” system with one tappet-controlled exhaust valve. A return suction valve was in the piston, feeding fuel on its downward movement. There was also a similar solution, but without the valve in the piston, fuel being sucked the same way as in a two-stroke engine. A third solution had two tappet-controlled valves, being similar to the static four-stroke construction. All those solutions were very vulnerable to centrifugal forces, which influenced not only the timing gear but also lubrication and load distribution. That caused great trouble with using these engines, especially affecting attempts to build higher-rated units of the type. Flying-wise, the engine’s moment of reaction was very bad, being transferred onto the airplane. It caused the aircraft to tend to rotate in the direction opposite to the engine’s rotation. 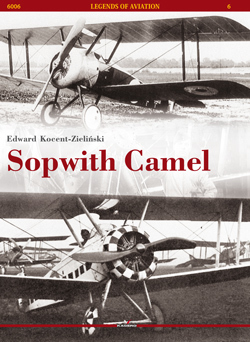 It was difficult to control this phenomenon, especially with lighter aircraft, the Camel being one of them. This was addressed by the use of bi-rotational two-bank units (the banks rotating in opposite directions). But this again caused a weight increase, while further complicating the construction; also, it caused a much worse cooling as a result of two times fewer rotations of the banks of cylinders. Despite such troubles many firms focused on rotary engine production, their units usually not exceeding 150 hp. The Entente forces bought them mainly from Clerget, Le Rhône and Bentley, various technical solutions being employed in their constructions. These companies also delivered engines for various versions of the Sopwith Camel. It appears, though, that time filtered all those varieties and types of rotaries, for on analysis by technicians and pilots it was found that the best construction of the type was the original Gnome Rhône of 80 hp. It should be assumed, then, that this rating and related constructional features aided by experience were optimal. Famous combat and test pilot Cecil Lewis confirmed this by expressing his opinion saying about the Morane Parasol that the 80-hp Le Rhone tractor engine was in its front part, this engine being just perfect – the best rotary ever built. It was unusually flexible and could be made to work extremely evenly at low throttle – it was tuned perfectly across the entire range. When at full throttle, it gave a high-pitched, full sound, a kind of ringing. If it was heard from a distance, it seemed like a wasp returning to her nest. On top of that, this engine was extremely reliable. The many attempts to modify the construction of the rotary badly influenced production issues. Attempts to perfect this type of aircraft engine ended when well-performing radial engines came along, particularly the high-performance liquid cooled V-type units. But that was after WW1 and those engines were the last piston-type high-rated aircraft power plants. Still, rotary engines continued to be used in many countries until mid-30s. The first pre-prototype Sopwith F.1 was finished on Dec 22, 1916 and first flown at Christmas by Harry Hawker. Armed with two synchronized 7,7 mm Vickers machine guns on the fuselage in front of the pilot, it was propelled by a Clerget 9Z rotary of 110 hp. The guns’ breeches were enclosed in a hump which, slightly raised, was a substitute for a windscreen. The single-piece upper wing had no angle of setting in order to simplify production, while the lower one had and angle of 5 deg. This layout was the common feature of Camels throughout and was an effect of trying to achieve the best aerodynamics available. The wings were rectangular with rounded corners. Initial tests showed the machine was unusually maneuverable, while its weight distribution and wing layout made it react very quickly to even the slightest movement of control surfaces and ailerons. Pre-prototype tests continued till Feb 1917, mainly at Brooklands field. At the same time next three machines were being built, they being prototypes proper. The first one, designated F.1/1 and named “Taper Wing” had tapered wings. The wing cell had wide single struts. Upper planes were joined to the wing canopy with a small cutout for better visibility. The guns’ breeches had a different, more flat enclosure. A new, higher-rated 130-hp Clerget 9B 130 rotary was the power plant. This aircraft had been expected to be more maneuverable and have a greater level-flight speed. It turned out, though, that requiring much more labor to build (e.g. Every wing rib was different), it offered flying qualities not much better than those of the original model. The lifting surface load, minimum and landing speed were all higher compared to the latter machine. Considering all the pros and cons of the construction, it was abandoned, even though the British aviation committee recommended in Dec 1917 that further four examples be built and developed (they were to be named the Sopwith 4F Taper Wing Camel). On the analysis we have mentioned, the old solutions tried with the F.1 were restored, which resulted in the F.1/2 prototype being the direct successor of the pre-prototype. This aircraft had been ordered by the RNAS and serialed N517. It did not differ much from the F.1. Its upper wing of several sections had a wing canopy with a cutout for better visibility. The breech hump was similar to that used on the F.1 but had a small celluloid windscreen fitted to it. The F.1/2 was first flown on Feb 26, 1917 at Brooklands. After factory tests it was sent to RNAS base at Dunkirk for operational tests e.g. with 9 Sqn (early May), 11 Sqn (June). There the aircraft underwent comparison tests against the Nieuport (Lt. S. T. Edwards). It was further sent to 12 Sqn RNAS, where it was damaged. Another accident was serious enough to have the craft wrotten off on Aug 20, 1917. On Mar 24, 1917 Martlesham Heath welcomed the third prototype, the F.1/3, with a single-piece upper wing. Originally it was propeled by the Clerget 9B engine. Later, Le Rhône 9Js of 110 hp were fitted as well as an experimental Clerget LS, which was designated Clerget 9BF, of 140 hp. This version became the model fr series production. The name Camel was invented to the very gun breech hump, reportedly by one Martlesham Heath test pilot. In Apr 1917 at Martlesham Heath another prototype based on the F.1/2 was tested. It was intended for the RNAS and serialed N518. It featured a new A.R.1 engine of 150 hp derived from the Clerget 9B. Tests showed this prototype was evidently better than the others. Due to urgent demand, series production commenced prior to F.1/2 tests. Camels were soon mass-produced by the mother company as well as other companies under license. The first batches were built by: Sopwith Co Kingston 50 pcs (N6330-N6379 for RNAS), Ruston Proctor & Co., Lincoln 250 pcs (first license of May 22, 1917). These companies could not meet the demand so license was granted to the following: William Beardmore Dalmuir; Boulton & Paul, Norwich; Britisch Caudron London; Hooper & Co. London; March, Jones & Cribbs, Leeds; Nieuport & General Aircraft London and Portholme Aerodrome, Huntingdon. The first 50 Camels were delivered on Apr 7. In total, 48 batches were made. All production aircraft had three-section upper wings but were generally not different from the F.1/3. The entire order volume was 5,697 machines and about as many were indeed built. As always, these data can differ from other sources due to factors like various ways of counting the aircraft (e.g. prototypes, experimental and re-engineered machines) by various authorities. The aforementioned circumstances resulted in the Camel being fitted with various rotary engines as the consequence of trying to optimize the power plant. The pre-prototype had a Clerget 9Z of 110 hp; F.1/1 a Clerget 9B of 130 hp; F.1/3 a Clerget 9B and later Le Rhone 9J of 110 hp, experimental Clerget LS of 140 hp (later designated Clerget 9Bf). The requirements to be met by the constructions (and probably also other, non-technical, reasons) resulted in RFC aircraft being fitted with Clerget 9Bs and RNAS machines usually featuring Bentley BR 1s. The licensed Clerget 9B was an unreliable unit, losing power after about 10-15 hrs of running. The consequence was a dramatic decrease in speed, particularly affecting the rate of climb. E.g. two production machines tested in Apr 1917 at Dover were unable to climb to 3,050 m in 13 minutes, whereas the prototype with a weaker engine did in 6 minutes and 50 seconds! This behavior was investigated and revealed original French Clerget 9Bs were much more durable than licensed British ones, the latter being affected by the speedy loss of power. Further examination revealed timing gear failures emerging after a short running time, which required constant repairs and tuning in order to keep the engine power. As Camels’ operations confirm, squadron mechanics somehow coped, but firstly, it was not the solution, and secondly, the defects reappeared. It seems that wartime conditions prevented maintaining the quality required by engine production. This was the reason for looking for other constructional and technological solutions. The N518 aircraft was fitted with an engine newly engineered by an RNAS engineer, Wilfred O. Bentley (famous car designer), designated AR 1 (Admiralty Rotary) rated at 150 hp. It was a derivative of the Clerget 9B, with cylinders featuring aluminum cooling ribs and steel cylinder liner. Designated BR 1 (Bentley Rotary), it was one of the best 9-cylinder rotary constructions used on the first Camels of the RNAS at the western front. All in all, rotary engines and their supporting installations used as power plants for Camels were the cause of many troubles, their many types and modifications used on production aircraft making it still worse. To bring some order into the state of affairs, Gen. Trenchard (RFC commander) ordered on Dec 9, 1917 that production machines be fitted with the lower-rated 9-cylinder Le Rhône 9J of 110 hp, which ensured a better rate of climb for the Camel than the Clerget 9B. Later production aircraft were fitted with Clerget 9Bfs of a greater piston stroke, nominal power of 140 hp and maximum power of 160 hp, thus a little more than Bentleys. Later, all the earlier built Camels were to be re-engined, which at French units began only in Apr 1918. Another almost constant trouble was insufficient engine deliveries. The British industry delivered only 2,000 Clergets in 1917 and over 2,000 more needed to be bought in France. On the other hand, the much better Bentleys had been by the end of 1917 built in a quantity of only 270.